Instead of spending money on new clothes, try these tips to change up your wardrobe and then spend the money you save helping someone in need! Being grateful isn’t something to toss around lightly. After living in Mexico for almost five years and volunteering for Dress for Success, I’ve seen my share of strife. I’ve styled impoverished women, women fresh out of prison and homeless women, all of whom were grateful for their second chance and looking for a job or career to better themselves and their situation. After being homeless myself, gratitude is something I practice daily. While we focus on what we’re grateful for this Thanksgiving season, let’s not forget to even be thankful for the clothes we have and can stretch to make into new outfits without spending a dime. And then maybe put that saved money toward helping someone else! Shake up your prints. Have a pair of print pants or a printed top? Pick another solid color to combine with it instead of the one you always wear. Bonus points for a color contrast! Combine dressy and casual. Mix a dressy top with jeans or pair your favorite skinny trousers with a casual top and jean jacket. Reimagine your cardigans. 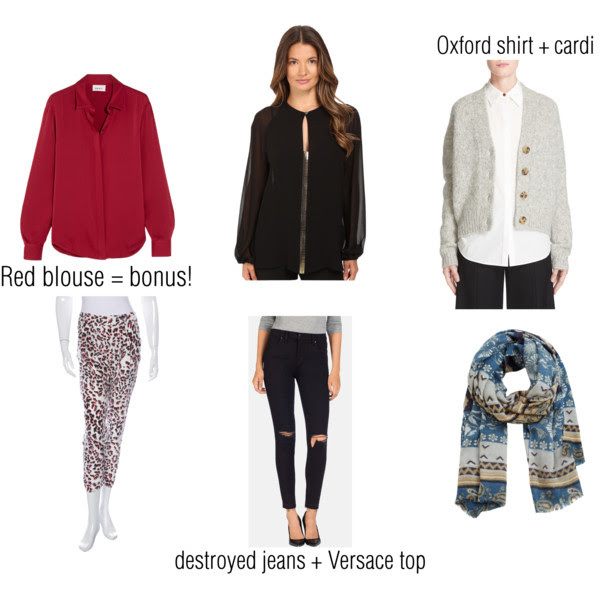 If you usually button your cardigans, try using them as a layering piece instead: leave your cardigan unbuttoned with a cami underneath and pop a scarf on top for a little more warmth. Just a few easy tips can give you a fresh take on your closet and make you thankful for what you have. Now go and pass it on! Go get your life girl, Live limitless!